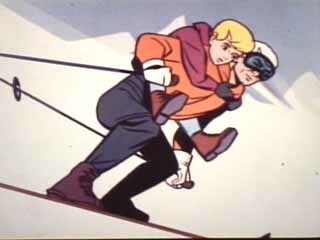 The Jonny Quest tributes shown here are essentially references to the show that have occurred within other television shows and theatrical films. 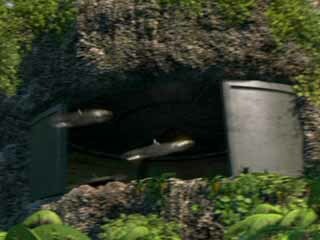 While some mention Jonny and/or the show by name, other tributes are simply reproductions of iconic scenes and concepts. Gus has a pet dog named Hoodlum who has some striking similarities to Bandit, both in his mask-like markings and his yipping bark.. In one part of the scene, a pair of frogmen (reminiscent of Mystery of the Lizard Men) on skis briefly joins the chase. Warned by Hoodlum's barking, Gus shouts, "Dad, frogmen!! 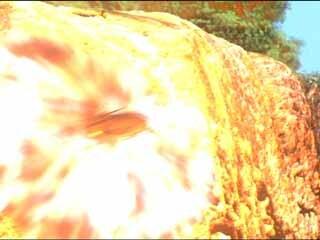 ", but the frogmen quickly disappear. Gus' dad warns him to "Stay low, son" much like Race told Jonny to keep his head down when the frogmen were chasing them in Mystery of the Lizard Men. 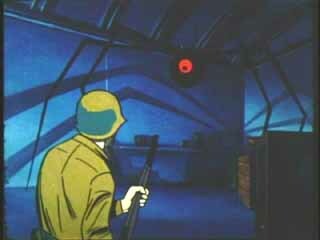 At the end of the scene, when bad guy has been apprehended, Gus uses a Robot Spy-like gun to cover the bad guy in slush. As the bad guy is laying in a heap of ice and snow, Hoodlum walks over and licks the villain's face (as it's sticking above the snow he's buried in). Gus is praised by his dad and Hoodlum barks, and then Gus' dad says "You said it, Hoodlum" and Gus and his dad share a laugh, again very much like at the end of Robot Spy where Bandit barks at Zin's "head" in the video monitor and Race says "That's right, Bandit - that's exactly what I was going to say" amid laughter by the team. 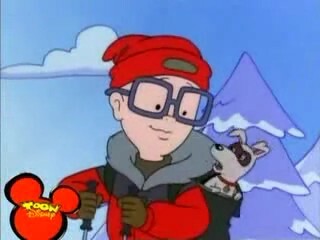 Here is a picture of Gus and his dog Hoodlum. 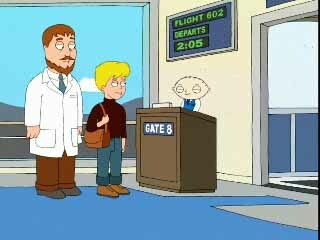 Stewie Griffin: Jonny Quest. OK, welcome aboard. Stewie Griffin: Dr. Benton Quest. Alright, have a good flight. 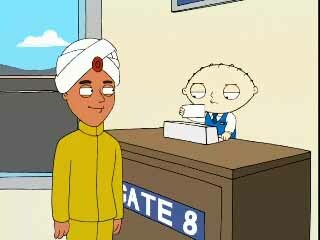 Stewie: Hadji. Hmmm.. 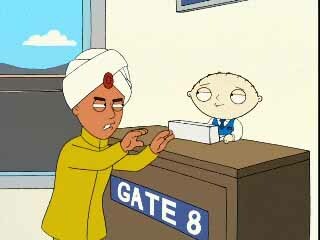 Listen, you have been randomly selected for additional screening. 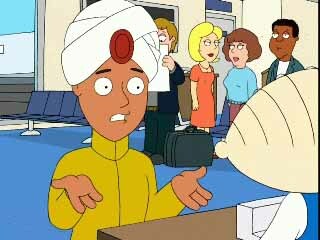 Hadji: But, you didn't even type anything in. 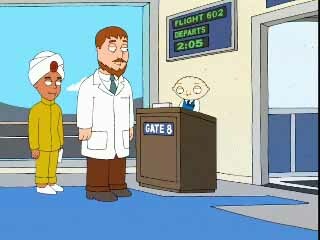 Stewie: Look, if it were up to me, you'd be right there on that flight. But, umm, I'm going to need to ask you to take off your shoes, and that lovly, umm, hat. 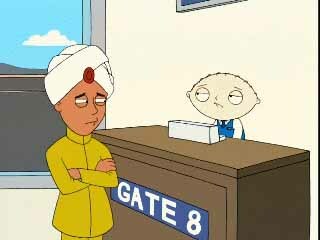 Stewie: Yeah, I'd cut back on that. Since Incredibles writer/director Brad Bird made an appearance on the Jonny Quest Season 1 DVD as part of one of the special features, it seems fairly well established that Brad is a big fan of Jonny Quest. 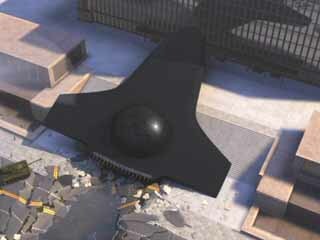 There are a number of items that (to me) look an awful lot like Jonny Quest tributes in the film. 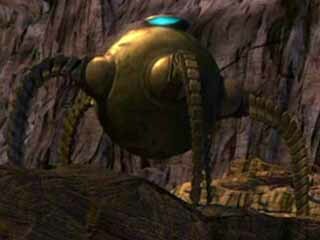 The huge mechanical robot that is used by Syndrome to wreak havoc on a major city looks quite a bit like the robot spider from The Robot Spy. Well, OK, it's not exactly the same, but it does have a round body with an "eye" and long spidery legs. Dr. Zin would've been proud, I think. 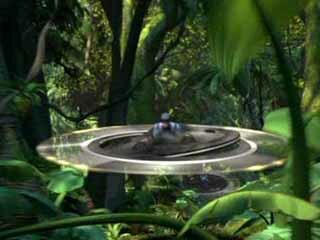 The aircraft used to deliver the robot to its target also is reminiscent of the craft Zin used. 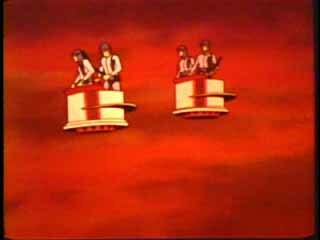 The uniformed henchmen in their hovercraft recalls similar garb and craft in The Fraudulent Volcano, although the JQ versions were two-man vehicles. 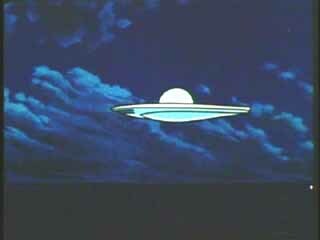 And, IMHO, the Incredibles versions are much cooler. But conceptually, they're very close. 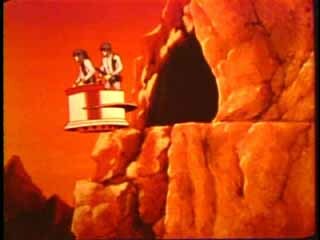 And the scene where one of the henchmen flies his hovercraft into the side of a cliff is eerily similar to a scene from The Fraudulent Volcano. 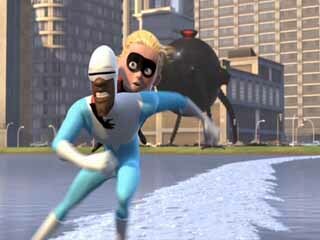 Frozone's quick pickup of Dash and their subsequent ice-enabled escape from the Omnidroid calls to mind a similar scene from Calcutta Adventure in which Race scoops up Jonny and carries him on his back on skis away from the bad guys and the avalanche. 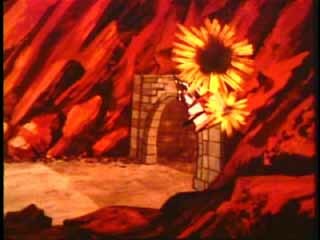 The short musical intro to the episode is almost an exact match to the intro played at the start of Jonny Quest episodes. Given a listen to the two clips to see if you don't agree! 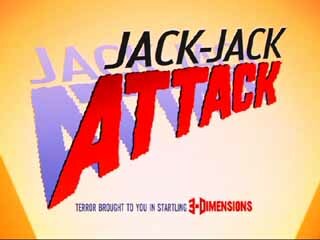 A short film produced by Cartoon Network that used an original score based on the JQ theme, voice clips from the classic show along with stop-action animation of figures of Jonny, Hadji, Race and Bandit and various monsters and villains to create a fun adventure game. Dr. Quest made only a brief appearance near the end in a diving bell menaced by a giant octopus. "Venture Brothers" a TV show from Adult Swim on Cartoon Network told several tales of a team obviously modeled after our heroes. 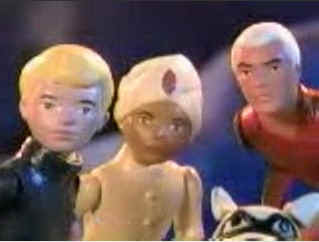 They even had Race Bannon guest star (and die an ugly death) on one episode. another Adult Swim TV offering had Harvey Birdman hearing the case of Race Bannon suing Dr. Quest for custody of the boys. Hilarious bits with monsters and villains from the show called as material witnesses. the elaborate mention by Dennis Miller in one of his TV shows. The band "Less Than Jake" with their track Johnny Quest Thinks We're Sellouts (even though Jonny's name is spelled incorrectly).